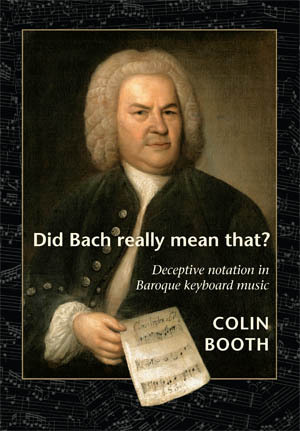 Colin Booth Did Bach Really Mean That ? - "an essential source for all musicians"
The “Early Music Movement” – to give it one of many possible titles – is always at the risk of becoming self-serving and complacent. After the commercial success in the 1980s of period instrument performances of every repertoire, consolidation has taken place. It only takes a glance at the current UK period-instrument scene to realise that the current young-professional generation are schooled in many different styles and techniques – equally able to handle Renaissance and Romantic repertoire with appropriate tools and background knowledge. A number of factors have led to this current state of affairs being accepted as the status quo. One of these is the expectations of the record-buying listener – and this dates back to the 1960s. Another is the “corporate orchestral” style and, presumably due to the financial demands on such organisations, their desire to remove the unknown factors created by the individual musicians taking the musical initiative on their own. This leaves the musical scene with ever-refined performances but lacking in the questioning and constant re-evaluating of evidence. This is crucial to enable the balance between performer personality and composer intention. Basic elements such as pitch, temperament (how the instruments are tuned), tempi and ornaments have often settled into a new standard which, while much more stylish than thirty years ago, are still a way away from the composer’s intention. It takes a great and brave musical mind - such as that belonging to Colin Booth - a highly successful harpsichord maker and player - to question aspects that have become de facto standards. Colin has been playing and teaching for 30 years and, in some ways, this new book and his recording of Bach’s Goldberg Variations, represents a distillation of discoveries made during this time. Immediately the re-evaluation is felt in the before-the-note grace notes of the opening theme of Booth’s Goldberg recording. The highly informative booklet note of the CD goes some way to outline the key areas of this well-played account, which has a cosy, domestic sound placing the listener fairly near the soundboard of this Fleischer harpsichord in a rather small room. This may not appeal to all listeners – especially those on headphones – but it feels very “true” and excitingly live. The disc was recorded in Colin’s music room with fully professional digital equipment and then edited by Jonathan Lane. This process is clearly an efficient one, though there are one or two editorial decisions that surprised me - the long pause at the end of each half in Variation 9. However, this does have the advantage that this feels like a live performance – a certain other debate needed, especially in relation to the improvisatory nature of baroque music. In each variation the interpretative challenges are assessed, the underlying character (usually a dance) of the piece given precedent and the various notational issues addressed. This provides many surprises on first listening but they are played with conviction and assurance and they are generally very convincing. Backed up with such scholarship it is impossible not to be impressed by this production. However, pair this with Colin’s new book, Did Bach Really Mean That ?, the achievement is magnified well beyond mere important re-thinking and becomes an essential source for all musicians. Physically, the book is well-produced and is clearly set and laid out. There is more than a nod in the direction of the current text-book vogue – each chapter is headed by a box laying out what the chapter will explore (and, more importantly, why) and ends with a “what we have learned” conclusion which, for a detailed study such as this, is remarkably helpful. One of the major things the book does is to detail, in context, the available evidence of ornamentation and evaluate their relevance towards Bach’s keyboard music. Colin also offers personal feelings about each source’s importance as regards its conception. This means that each interpretative decision can be made weighing the various options and coming to own conclusions. One of the successes of this approach is that the reader is left to make the final decisions in his or her own case. Colin offers detailed observations and offers his own conclusions as well. This is well illustrated by the afore-mentioned opening of his Goldberg variations recording: the “before-the-note” grace-note is performed as, in Colin’s view, the more likely interpretation of a number of conflicting instructions from the period. This book should be bought, read and studied by everyone who has more than a passing interest in the music of J S Bach.